Do you work at Garufin? What did you think of Garufin? I went there with several friends for a birthday dinner on a mid-week night. The place was fairly empty, but we certainly didn't mind the personal service we got as a result. We had roughly four courses a piece (empanadas/platitos/steak/dessert) and several bottles of wine for £40 a head. The portions are small, but they're also quite inexpensive so it's a great opportunity to try several and pass them around the table. I'll definitely be returning to explore the rest of the menu. I went there with my family a month ago and we had a great experience. I loved the small portions so that we could all share and try different things. The meat, as I was expecting, was delicious. I was blown away by the Quadril & mazamorra, £150g of rump steak with white corn cream & fried mushroom ravioli for under £8! Everything else was really well cooked, well seasoned and nicely presented and we enjoyed a very nice bottle of Malbec for about £25. I loved the cosy atmosphere and the friendliness of the staff. I highly recommend it!! The meal we had was over £70 a head (Tapas and a bottle of wine between two) and I was left very hungry. Small portions and to be honest, lacking in flavour. the steak which should have been the star of the show was over-cooked and the cheapest bottle of wine started at £40 and was pretty average. The service was beyond terrible. We were one of three tables on a mid-week night and it took them over a hour to take our order and even longer to take our money. The waitress was rude and we asked if we could pay as we had been waiting a while, she just shrugged her shoulders and walked in the other direction. I walked over to the bar to say we were unhappy in private and she wouldn't look at me. I asked her to remove the service and she refused. (still not looking at me). To be fair to her, she was left on her own at the end of the night, but no reason to be extremely rude and she really didn't have that much to deal with. I left £140 lighter, offended and hungry. 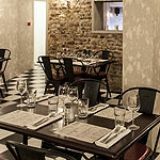 With a casual ambiance and simple décor, Garufin (the sister restaurant to Islington’s Garufa) showcases top-quality food and wines from across Argentina. Tucked beneath the ground floor café/bar level, the basement restaurant is the more formal dining option at Garufin. With just a bar and a small number of tables, mostly set for two, the venue is small and intimate. 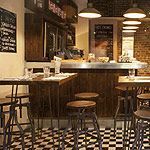 The décor is unashamedly simple - almost bare - with exposed brick, a black and white chequered floor and iron chairs with red vinyl covers adding points of interest. Each table is set with a candle floating in a tin can: back alley romance a la Lady and The Tramp. The vibe is casual chic with no rushing about or fuss. 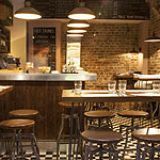 Although the simplicity of this “Argentine Kitchen” can be jarring at first and almost cave-like in its small basement setting, there grows the sense that you’re in a kitchen cellar and Madre is going to cook you up something special. Although an ideal spot for a quiet date, the size of the venue wouldn’t be ideal for large groups. On a Wednesday evening in November it gets rather busy with trendy young couples, speaking of the good food and wine. Casava crisps start the meal off with a satisfying crunch; thinly sliced and perfectly salted, the crisps are a refreshing alternative to a standard bread basket. Empanadas (£2.50 each) are a traditional and appetising first course; both the saltena (spicy beef) and mondongo (spicy tripe and ox cheek) have light, tender pastry with moist fillings, though neither is particularly spicy - nor are they drastically different in flavour. The provolone is a major hit. Served in a cast iron skillet, the melted cheese has a lovely gooey texture without being rubbery, the artichokes are tender and soft, and the dish is garnished with fragrant, fresh oregano - what’s not to like? The national dish of Argentina, locro, is a thick stew with spicy chorizo, pumpkin, and extremely tender pulled pork. Lively, rich and colourful, the locro is authentic and a good choice for a kick of spice. Better suited to mild palates, Garufin’s quail dish is cooked at 70 degrees for over four hours allowing the meat to melt off the bone with a sumptuous and delicate flavor. Served in a small mason jar, it has to be pulled out of its juices and plopped on to the plate by the diner, so shield the eyes of vegans, and those faint of heart. For those seeking Argentinian steak, the bife de chorizo (£16) is a top-quality cut cooked with skill and prepared simply, though the humita (ordered alongside the steak) is surprisingly the more memorable selection. A heavenly concoction of corn and spices, this steamed savoury cake is a sweet and creamy attention-stealer. For dessert, the chocolate fondant (£5) with milk ice cream and fig is all that it sounds: rich, warm and decadent. Picada 15 from the Patagonia region (£30) is a versatile, medium-bodied red that complements each course beautifully, and is a great choice to order by the bottle. A blend of Cabernet, Merlot, Malbec and Pinot Noir, Picada 15 is smooth, has hints of berries and isn’t overly sweet. Though it might need to smooth out the odd edge, Garufin focus on preparing traditional and modern Argentine cuisine with authentic, top-quality ingredients makes for a very satisfying dining experience.